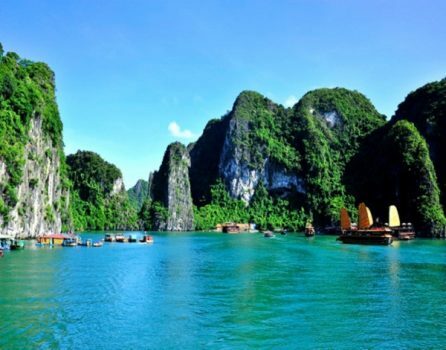 With thick jungle vegetation, thousands of islands and islets forming a magnificent natural landscape, Halong Bay is one of the top world’s travel destinations. 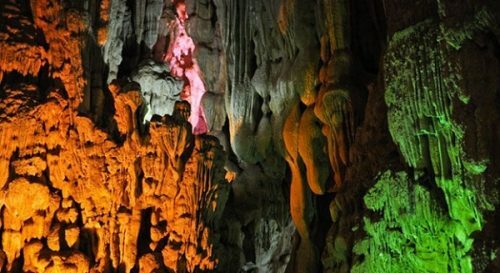 Some of the islands are home of some floating villages of fishermen while others include lakes and enormous caves.1 or 2-day trip around Halong area will give you nice memories which will be imprinted in your soul and your heart for good. 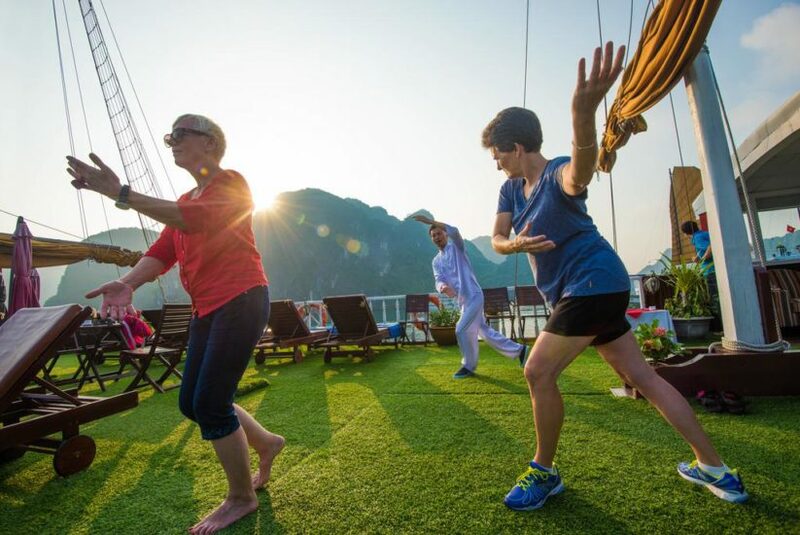 To discover the world nature heritage recognized by UNESCO, you can take a journey around the bay with various luxury Halong Bay cruises, one of which is the first cruise of Gray Line World Wide in Vietnam – Gray Line Halong. 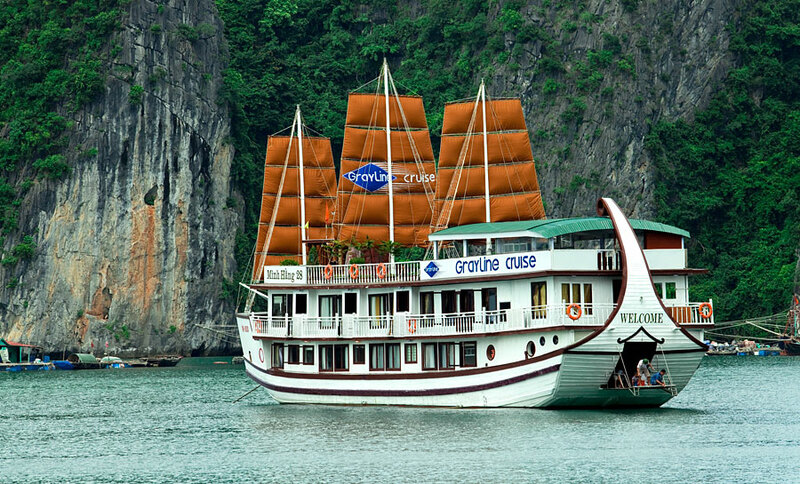 Featuring a luxury set of services by the professional teams and a unique design of Vietnamese traditional wooden junk, Gray Line Halong is a brand new cruise in Halong Bay but not new to the rest world. 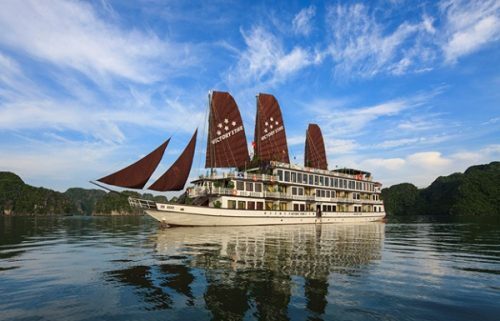 Newly brought to Vietnam, Gray Line Halong is proud of being the very first oceanic overnight cruise along the history of 103 years of Gray Line Worldwide. Travelers will definitely be charmed by her unrivalled home from home service and exquisite intimate, luxury setting. Enjoying Gray Line is such an unforgettable way to witness the calm, serene settings of exceptional natural charm of Halong Bay. 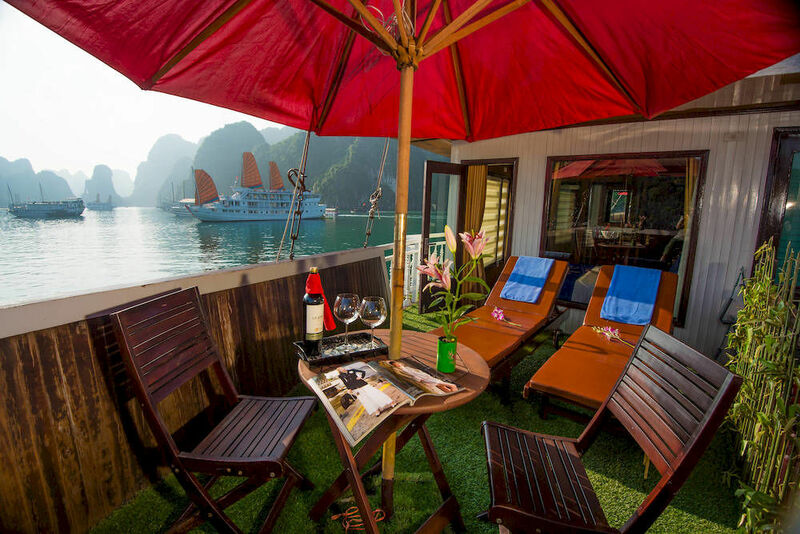 With 14 luxury cabins spreading over 3 decks, Gray Line Halong boasts boutique interiors with oak-wooden wall, all bathrooms and rooms having gorgeous sea-view, private balcony and private sundeck. If you want to combine the scenic atmosphere with your delectable cuisine, you should be quick to reserve outdoor dining tables. Ease your mind by special cocktails or gear-up youngsters’ adrenaline by rock music at the 2 distinctive bars (1 indoors and 1 outdoors). 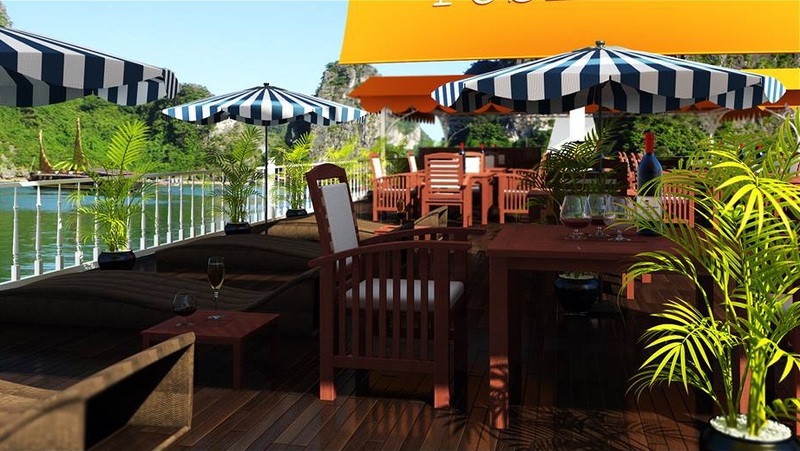 The top deck serves as an ideal spot to enjoy lingering in the sunshine and exploring the awesome beauty of Halong Bay with a 360° view, thus ensuring precious and thoroughly relaxing moments. Good service is the key focused by a friendly, dedicated and professional team. 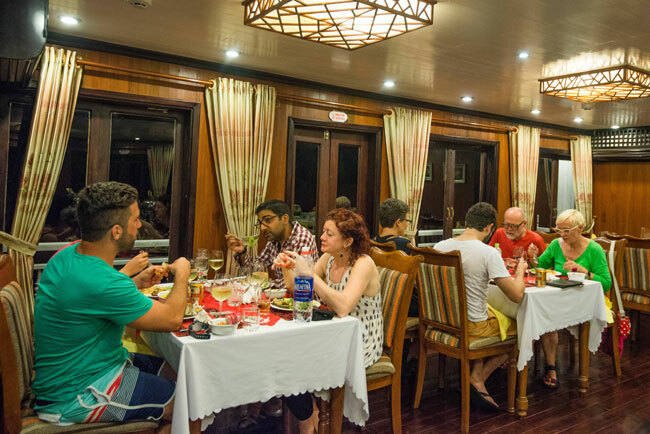 Spending your time on Gray Line Halong cruise, you are bound to enjoy a set of luxury services onboard controlled by the high quality management of Gray Line Vietnam. All the bartenders and chefs come from well known training center and are experienced enough to cater not only Asian but also Western styled F&B in other 4 and 5-star restaurants while all crew are well-trained under the standards of Gray Line in a course of 6 months. Not only having a good mind of customer service, the Sales & Reservation teams in Hanoi always take care of your trip and are flexible to meet any special demands. To guarantee memorable cruises, know-how and well-done are their internal mottoes. The enthusiastic individuals of crews are committed to making your stay more memorable and special. Exploring the bay with sailboats, on the classic wooden boats and joining an adventurous journey surrounding Halong area is the most interesting activities that you can do in your vacation . Your trip will be more memorable as Gray Line cruises on the blue sea to let you see the splendid islets covered by the green. Relax in your luxury cabin with full equipment in case feeling tired. You can enjoy delicious cuisine cooked by the best chefs in Vietnam in the junk’s restaurants. If visiting Halong Bay, you should not miss a chance to row kayak to visit Cam Dong and Vung Vieng fishing villages to admire the jaw-dropping view of the bay as well as know more the daily life of fishermen here. Rowing into the caves to explore a large number of stalactites at various strange shapes is the most interesting thing to visitors. Moreover, when their kayak touches the mountain foot, they will have the feeling that they have never been through before. To discover Halong Bay in your own way, you can row with friends or alone. 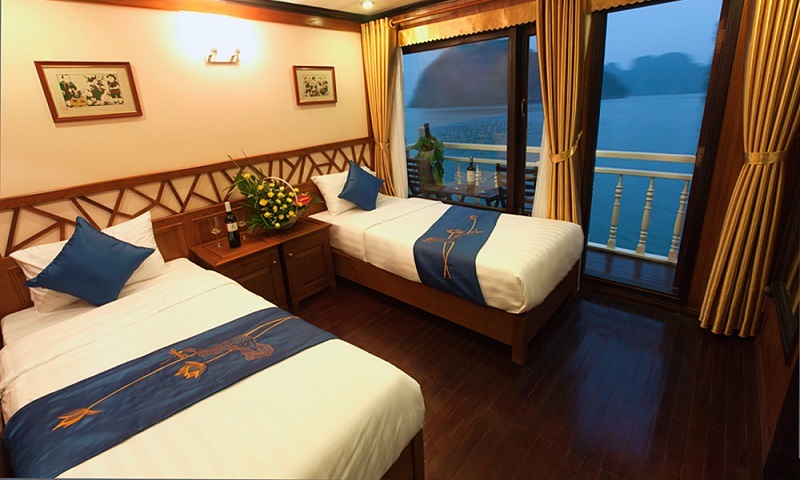 Overnight on boat is another way to discover Halong Bay without sleeping in hotels. Watching sunset or waiting for the dawn on the sea is an overwhelming feeling that you cannot forget. The nightfall, when you can lie on the deck to watch the starry sky, is the best time to enjoy quietness. Party on boat and squid fishing are attractive activities for a group of tourists.